Thanks to our mid-west member for passing along this video of the great libertarian Judge Andrew Nopolitana speaking about the non relationship of healthcare & the Constitution. The Judge is a constitutional expert. In this video he explains, among other things, the Founders' meaning of the Commerce Clause that has been used by Congress exactly the opposite of its original intent - namely to regulate anything & everything they please under the guise of regulating commerce per the Constitution. In the case of BO's currently seemingly stalled healthcare insurance reform, relying on the Commerce Clause is once again the plan to ward off the constitutional challenge of 13 State Attorneys General presented on this blog last month. Now BO's invitation for the Republicans for the first time to join the healthcare reform negotiations starting on February 25 is just the latest ruse that will end with the Senate using the parliamentary maneuver called "reconciliation" that does away with the long standing Senate rule that requires 60 votes to bring a bill's deliberations to cloture. Only a simple majority of the Senate is required under "reconciliation." Of course "reconciliation" will not be needed if the Republicans capitulate which is highly possible. BO, Pelosi, & maybe Reid consider using "reconciliation" despite the Massachusetts victory of Senator Scott "41" Brown. Betsy McCaughey sums up this chance of a generation for the statists - "Obama defends the current Democratic health bills, claiming they will reduce the deficit. That's a shell game. These bills are paid for with $500 billion in new taxes over ten years. A vast expansion of government is not deficit reduction. It's freedom reduction." And that is exactly BO's intention. I have received many thoughtful & insightful comments re the recent messages concerning both the Social Security solvency problem & the improvements needed for BO's budget. In the opposite vein please consider the following paradoxical points that highlight how easily the majority of people are controlled & can be purposely led in the wrong direction because of a lack of common sense or otherwise not being able to think for themselves. 1. AFP reports that BO picked this past week to announce the formation of a new global warming bureaucracy within the Department of Commerce. The news conference announcing this new "climate service" had to be canceled due to the D.C. area blizzard. Cap & Trade remains BO's next priority. 2. A recent Gallup Poll indicated that 36% of Americans have a positive view of socialism, including 53% of Democrats & 20% of conservatives. With re to the Democrats I would have thought it was higher than that. America has been over 50% socialist for decades. Assuming the 36% of Americans with a positive view of socialism are part of the 70% of our citizenry who receive some sort of government check or benefit it means that 34% of us are not satisfied & possibly want to go further into government dependence. 3. Government programs are expected to account for more than half of all healthcare spending by next year - this is before BO reinvigorates his universal healthcare program with negotiations with the Republicans on February 25. 4. Maricopa County Sheriff Joe Arpaio was stripped of his certification by the ICE division of DHS to enforce federal immigration laws because some human rights groups criticized his enforcement of these laws for allegedly using racial profiling. After Cap & Trade BO plans comprehensive immigration reform. Sheriff Arpaio plans to ignore ICE's order saying that he has the inherent right to enforce the law. 5. BO continues to study whether or not to try KSM in NYC - a hard decision for him. With re to this pending decision & BO's State of the Union criticism of the Supreme Court's broadening First Amendment rights to corporations Roger Rice writes - "let me get this straight - it is all right to grant Fourth, Fifth, Sixth, & Eighth Amendment rights to foreign terrorists who want to destroy the U.S., but granting First amendment rights to foreign corporations, many of which have businesses in the U.S. & hire American workers, is wrong." 6. Monthly healthcare insurance premiums for a 20 year old in Indiana range between $50 to $202 while in NY the same person with similar coverage pays premiums anywhere between $832 & $ 1,047. The difference is almost entirely due to NY's regulatory mandates that require such things as chiropractic & maternity (including people who can not have babies). When the healthcare debate begins again without the provision to buy healthcare insurance across state lines think of this example. 7. The economic performance of the PIGS of the Euro Zone (Portugal, Ireland, Greece, & Spain) threatens another financial crisis. America's debt burden statistics (deficit/GDP, national debt/GDP, & interest payments as a % of revenue) resemble Greece's more & more every day & yet BO & the Democrat controlled Congress continue to propose programs that will plow us deeper into debt every week. 8. The wage gap for American workers keeps getting wider each year & thousands of manufacturing jobs continue to be outsourced yet manufacturing output increases. The average manufacturing worker's output is almost $250,000 per year & the American manufacturing sector is the 4th largest economy in the world behind the USA, Japan, & China. Why would someone stop their education & training @ the point where the work they are qualified to do can be done by another in a foreign country making pennies a day unless they were brainwashed into thinking government will take care of them? 9. Recent polls show that if the 2012 presidential election were held today that BO & Mitt Romney would be in a statistical dead heat. Now as we know the great majority of Americans are against BO's healthcare insurance reforms & yet the Republicans keep putting Romney forth as a preferred candidate even after his healthcare insurance reform plan in Massachusetts has been a proven disaster. Based on the above points you can easily think that the world is upside down - where we can no longer tell right from wrong. It is only people who take the time to read messages like these & get involved that can correct & make it right - there is simply no one else. It is up to us to return the world back to the point where wrong is no longer right & vice versa. Along the way you can walk not run past people who are not the least bit concerned that Social Security benefits paid last year almost exceeded the taxes collected. These same people are worried to death that the earth may be one degree centigrade warmer 100 years from now. Last week was another monumental despicable one for America's finances under BO's administration. First BO presented a $3.728 trillion dollar budget where 31% of the outlays are financed through borrowing - meaning another $1.15 trillion will be added to our national debt. The federal budget was $2.7 trillion only two years ago. Next, Congress voted to increase the debt ceiling by $1.9 trillion - this followed a $290 billion debt ceiling increase on December 17. The debt ceiling is a tool to provide the Treasury with more leeway in the administration of debt - as if they need more leeway. Now these numbers are so large they really become meaningless to most of us other than they sound like trouble brewing so the best thing to do is to refer to something like the above graph prepared by the Government Accounting Office in 2007. Since the graph is almost 3 years old it does not include BO's draconian spending increases of the past 13 months. 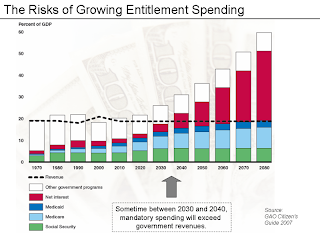 It is going to be sooner than shown on the graph that mandatory spending will exceed all government revenue thereby leaving no money @ all for any other program like defense. Jim Bennett has a slide that he uses in his seminars that shows only interest on the national debt consuming all of our revenue in the not too distant future. BO has recently tried to camouflage his reckless profligate destructive spending ways by talking about reducing the deficit but this is just another ruse. The real fiscal danger, as BO very well knows, is the amount of government spending not the deficit - Professor Milton Friedman used to teach that the nation would be better off with a budget half the current size but with larger deficits. For BO to balance (no deficit) a large spending budget through taxes will still bankrupt the nation before long - just as he plans. Please check out this video of our Posterity reciting a pledge to the debt we will leave them. We have momentarily held off BO's programs for both socialized medicine-universal healthcare & Cap & Trade legislations thanks to the Town Hall & Tea Party movement - & nothing else. I hope that people saw Sarah Palin's presentation @ the Nashville Tea Party Convention on Saturday night & will continue to get behind & support this movement. In the meantime if the fiscal integrity of America is important to you I recommend that you let your elected reps know that you have some suggestions for improving BO's budget plan - like, for starters off the top of my head, elimination of the Departments of Health & Human Services, Education, Commerce, Agriculture, HUD, Transportation, the EPA, the National Endowment of the Arts, & the National Endowment for the Humanities, & the progressive income tax & replacing it with the FairTax. 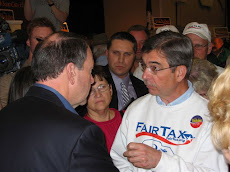 The FairTax will be featured again on the Jim Gearhart Show, NJ 101.5 FM radio, this Thursday morning, February 4, 2010 after the 7:00 a.m. news. Jim Bennett will be on for at least half an hour &, if there are enough calls, stay for the full hour. As you know, NJ 101.5 FM is one of the most popular news-talk shows in New Jersey, and it competes with national media out of New York and Philadelphia. 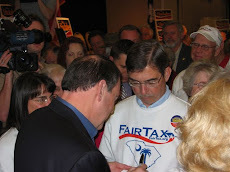 Jim Gearhart is having Jim Bennett back because of the overwhelming response to the FairTax following the interview on the station last month & to answer questions that Mr. Gearhart did not feel he was able to answer himself. Please call in to the show at 1-800-283-1015 Thursday, between 7:00 a.m. and 8:00 a.m.
You can also listen through the Internet by clicking here. Long time readers of these messages know it seems like ages since the Iraq front in the war against Islamic Fascists has been the subject of these messages. The WSJ's report of last week's interrogation of Tony Blair by the John Chilcot Commission brings the issue back into focus. Below is my letter responding to the Journal's great editorial entitled "Tony Blair's Iraq Statesmanship." Suffice it to say that the majority of Americans have learned nothing about preserving our security since 9/11 & BO continues to exploit this ignorance as he refers to the would be (not alleged) Christmas bomber over Detroit as the "Nigerian student," holding KSM's civilian trial in NYC (although even this is becoming a too obvious destructive ploy against America), & of course vowing to close the Guantanamo prison for no good reason. The danger to America & the world could not be more front & center as Iran fails to acknowledge BO's December 31 deadline to take up his invitation to negotiate their nuclear program. I refer to my posting immediately below, dated July 14, 2007 - nothing has changed except adding our troops in Afghanistan to the immediate jeopardy. "Middle East oil dependence is one thing but the nuclear ambitions of our Muslim enemies is another. Iran has had nuclear ambitions for quite some time & there are many intelligence estimates that conclude that Iran is very close to obtaining nuclear capability - a capability that the Iranian President has said he will share with every Muslim nation on earth & I think he would also include al Qaeda in Iraq. Since Iran constantly sends IEDs & car bombs into Iraq to kill our troops by the dozens, just think what would happen if Iran gets a nuclear bomb & its first unannounced target is the nearby Baghdad, where the Iranians couldn't care less about civilian casualties as they target 150,000 American troops in one fell swoop that would be like shooting fish in a barrel." You write in "Tony Blair's Iraq Statesmanship" that it is "worth remembering" Mr. Blair's words "...given over one million people whose deaths he (Saddam) had caused, given 10 years of breaking U.N. resolutions, could we take the risk of this man reconstituting his weapons program?" Well not only do I remember but I will never forget the words of WSJ Editorial Board Member Susan Lee in the fall of 2002 answering Stuart Varney's question on the Journal Editorial Report - "can we afford to spend $87 million on a war in Iraq?" Ms. Lee responded "we cannot afford not to." The Congressional Joint Resolution authorizing the use of U.S. Armed Forces against Iraq was dated October 11, 2002. There were seventeen enumerations in the Resolution & I invite every one to read them to see how little mention there was of WMDs despite what the hostile anti-American media would otherwise have us believe. The grilling of Mr. Blair by the Chilcot Commission highlights to me that the lesson of 9/11 still has not been learned by many Americans. In 2008 then Senator Obama thought he had an iron clad position saying that he never was for the Iraq invasion. Mr. Obama was counting on people looking @ Iraq then & not remembering either the time or circumstances that resulted in our attack on Baghdad. Put yourself back to September 2002 - just one year after the murderous attacks on our soil by seemingly primitive people living in the mountains of Afghanistan. With all of the intelligence, literally in the world, pointing to Iraq as a terrorist haven & past user of weapons of mass murder - ask yourself if the majority of the electorate had learned anything by electing a commander-in-chief who thought we could afford to find out the hard way just how much of a threat to our survival Saddam Hussein was.